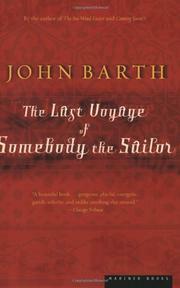 Barth is back with another big (544-page), bawdy, and "postmodernist" book, replete with the usual metafictional conceits, in which the "New Journalist" hero, a contemporary Scheherazade of sorts, likes to swap tales with the legendary Sinbad the Sailor, while trying to get his bearings, both metaphorically and literally. Simon Behler (pen name Baylor), born and raised in Maryland's Tidewater country, had made a name for himself as a journalist by writing a series of books about his own travels, experiences, and family; but now 50, he's out of fashion, his marriage is breaking up, and he's not sure what to do next. On assignment in Spain he links up with Julia Moore, his first girlfriend's kid-sister. The two, both expert sailors, decide to trace the voyages of Sinbad the Sailor; but off the coast of Sri Lanka (the legendary Serendib), a storm drowns Julia, and Baylor finds himself in Sinbad's household in medieval Baghdad. Each night after Sinbad has regaled his guests with a story, Baylor tells in similar installments the story of his life and how he came to be there with only his modern wristwatch to reassure him about his past. In love with Sinbad's daughter, the lovely Yasmin, who reminds him of the lost Julia, Baylor is also anxious to get back to the 20th-century. He marries Yasmin, and the couple set sail for Sri Lanka, but, echoing that other voyage, Yasmin drowns in a storm, and Baylor finds himself back on the shore of Maryland. Filled with an abundance of colorful characters and settings--but less a novel than a series of insubstantial set-pieces, liberally padded with explicit sexual scenes, in which poor Baylor is always at sea, one way or the other. A thin story in a very fat book.